Located at the corner of Ahua St and Kilihau St, Extra Space Storage serves Honolulu residents near Fort Shafter, Kalihi-Palama, Liliha-Kapalama, Aliamanu/Salt Lakes/Foster Village, and more. Locals will recognize our facility next to Enterprise Rent-A-Car across the interstate from Keehi Lagoon Beach Park. 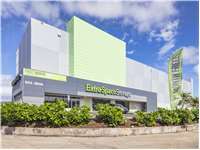 Looking for storage units close to Honolulu International Airport? Extra Space Storage is about 1.8 miles from the airport, providing a convenient self storage option for residents and visitors. Active military and families stationed in Honolulu can find reliable, affordable self storage at Extra Space Storage! Our Ahua St location is about 1.4 miles from Fort Shafter and 3.5 miles from Joint Base Pearl Harbor-Hickam. Extra Space Storage on Ahua St offers a wide range of storage units, climate-controlled storage, vehicle storage, and exceptional security, making us the go-to storage solution for you in Honolulu! Our Honolulu storage facility has unit sizes from 4x5 to 8x38 and unit features like indoor access, elevator access, and more. We can accommodate both residential and commercial storage needs! To ensure the safety of our customers, our Ahua St storage facility utilizes security measures like an on-site manager, 24-hour video surveillance, security access to your floor only, and individually-alarmed units. Protect temperature-sensitive belongings from Honolulu's extreme heat and humidity with climate control! Units with this feature maintain an environment between 55 and 80° year-round, keeping your items safe. Climate-controlled units are available in sizes 4x5 to 13x18. Looking for vehicle storage in Honolulu? Extra Space Storage has 8x20 to 8x38 covered outdoor parking spaces that can easily accommodate cars, motorcycles, boats, and RVs! It's easy to see why so many people choose Extra Space Storage. We go above and beyond to deliver a high-quality self storage experience. From our clean, secure facility to our friendly, professional staff, we provide dependable storage with excellent service. Contact us today to reserve a storage unit in Honolulu! this was the 7th unit we were hiring at this location, we have has storage units here for many years now The staff are super friendly, efficiant and just good at their job. The place is always clean and tidy. its actually a pleasure to come to this facilty rather than a chore. Nice facility. The pricing is very reasonable. It is a very clean and will lit facility. The elevators are very large and the A/C is great. The customer service people were very friendly and helpful. Very nice, clean storage facility. The staff were very friendly and helpful in finding us the right unit for our needs. It was a simple process and great experience! Price, location, space, availability, and customer service all on point! Excellent place to store your belongings, easy, safe, and secure! Edwardo provided excellent customer service and satisfaction. Extra space storage have friendly and easy going employees. And also the facility is clean and spacious. I am glad I chose here , you will not regret it . Best price for my storage needs and super nice professional service. Only location that was completely climate controlled. Roll up doors on all rentals best deal for storage for the price hands down. Great place. Friendly staff. Super rates. Easy to get access. Safe environment. Wonderful experience. Come check out a perfect place to store your things. I LOVE the staff! They are extremely polite and always willing to help. The location is great too. The pricing can be a bit much BUT compared to other places and what you're getting its completely worth it. This review is for the 633 Ahua St location, I really didn't know all of the benefits of this place because of their office hours during the weekdays. However with the referral of my mom having a storage unit with them, I relecutantly went to check it out with her. As we got there Nadine greeted us with a smile even though she was slammed with others she was assisting so we patiently waited and I was soo happy. They had 2 cargo elevators, which was the same height and width. Huge cargo bay for unloading your items. They have about 3 pallet jacks for use, along with 5 flat hand trucks. These are really helpful. We rode the elevator and you had to punch a code; which ONLY allows access to the floor of the unit. Even though they have 6 floors. I thought that was great. Then she pointed out all of the cameras. Above all of the units they sprayed cement above all of the units so no one can use a ladder and climb into someone else's unit, which my mom pointed out and explained it to me. Then the first unit Nadine showed was EXACTLY the space that I needed. So I was sold. Then she explained that there was an additional charge for their locks because it was one of those that doesn't stick out. She called a cylinder lock, which also tells her what time someone went it and out. I though that was cool. I also liked that it was a A/C, plus they installed solar panels to help with the electricity. Which I like supporting any business that is down with Being Green.They do have bathrooms that are open ONLY during business hours. The access times to your unit is reasonable, even though it's not 24 hours because of people sleeping in their units. The lights in their hallways are motion activated which I thought was smart on a business perspective to save money on electricity. So I signed up that same day and haven't regretted it since. As I moved our stuff out of our 2 bdrm apt it took us 2 hrs and being a women I always feel safe because it's ALWAYS well lighted. Very centrally located, clean and well maintained facility. Large elevator for large items! Facility is concrete and climate controlled to keep ones items safe and in good condition. I like the customer service I was given from Nalissa Johnson who is at the 96819 location. She smiled the whole time and answered patiently mines and my mom's millions of questions. What sold me was the freight elevators, NO GAP on the top of the storage, the access code to ONLY your floor, the security and the convenience to pay online. I'll definitely be recommending this storage to anyone who asks me. The storage unit is ok and I am happy with it BUT not happy that I have to wait sometimes to get to my floor due to other people hitting the elevator button on other floors first and then I have to go to their floor and back down to the ground before I can try and get to my floor again. Just hope no one will hit the button first before I can put in my code and password before that happens. Drive southeast on I-H-201 E. Take exit 3 and merge onto Puuloa Rd. Continue straight to stay on Puuloa Rd. Turn left onto Mapunapuna Pl. Turn right onto Mapunapuna Pl. Turn left onto Awaawaloa St. Turn right onto Ahua St. Turn left onto Kilihau St and our facility will be immediately on the left. Drive northwest on HI-92. Pass McDonald’s and continue straight. Keep right to stay on HI-92. Turn right onto Ahua St. Turn right onto Kilihau St and our facility will be immediately on the left. Drive southwest on Middle St. Take the HI-92 W exit and merge onto HI-92 W/N Nimitz Hwy. Turn right onto Ahua St. Turn right onto Kilihau St and our facility will be immediately on the left. Drive southeast on I-H-1. Take exit 15 and follow signs for Hawaii 92. Merge onto HI-92 E/N Nimitz Hwy. Turn left onto Ahua St. Turn right onto Kilihau St and our facility will be immediately on the left.